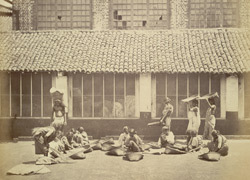 Photograph taken by Bourne and Shepherd in c.1870 of a group of estate workers cleaning and sorting coffee in Colombo, the capital of Sri Lanka (Ceylon). The photograph shows the female workers with baskets of coffee in the courtyard in front of the factory buildings. The British began a plantation-based economy in Sri Lanka in the 1830s and their coffee experiment took off with resounding success. The booming coffee industry was ruined when a leaf disease spread through the plantations by the 1870s. The plantation owners looked for a substitute crop and found tea a suitable replacement.